Running 4 Vets mission is to support disabled American Veterans and Veteran Non-Profit Organizations through social running events and various fundraisers. 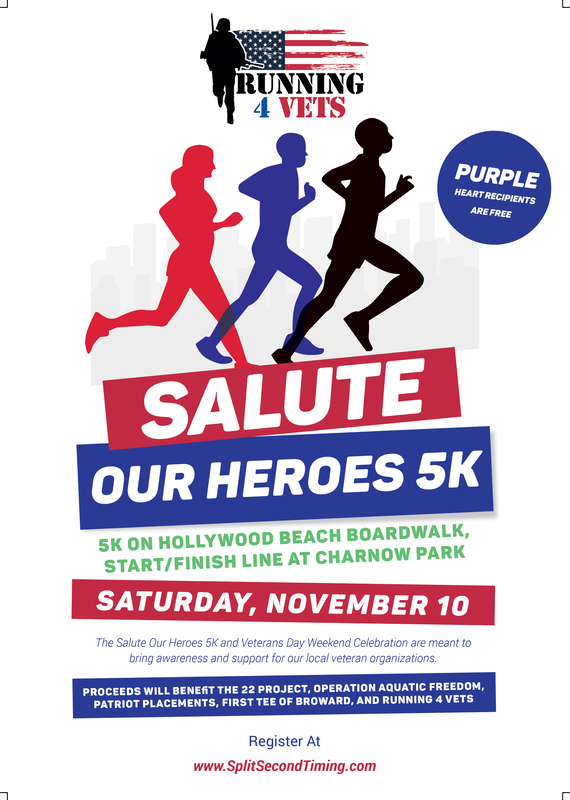 The Salute Our Heroes 5K and Veterans Day Weekend Celebration are meant to bring awareness and support for our local veteran organizations. This year's 5K will be held Veterans Day Weekend on the Marine Corps Birthday November 10, 2018. at 8:00 a.m.
With over 22 Veteran suicides a day and countless cases related to PTSD, anxiety, depression, and inability to reacclimate to civilian life, we owe our great nation’s heroes the help they so deservingly desire. We use recreation to combat these statistics, create change, and promote a healthy quality of life for our brave servicemen and women. The First Tee of Broward partners with United Way of Broward County's MISSION United to deliver free golf programs to local Broward veterans. Our program not only provides expert golf instruction delivered by PGA professionals, it also provides an atmosphere for fellowship, bonding and healing among our local veterans. We have provided our programs to over 200 Broward veterans since beginning in 2016. Running 4 Vets supports disabled American Veterans and Veteran Non-Profit Organizations through social running events and various fundraisers. You can help us raise donations as an individual or with a team. Ask family, friends and neighbors to donate on you or your team’s behalf. You can have lots of fun while helping raise money to support our local veterans! Prizes for individuals and teams who raise the most money will be awarded. This event comes with spectacular views! How do you want to enjoy it? Walk: Prefer a beautiful stroll along the Hollywood Beach Boardwalk gazing at the ocean? Set your own pace with walkers of all ages to celebrate the Marine Corp Birthday and Veterans Day weekend! Run: Think you can run as fast as our Active Military and Veterans? Challenge yourself to capture the gold in this years' 5K! Volunteer: Want to give back to your local Veterans? There are many opportunities to volunteer prior to the race as well as the day of the race. On Site Registration: 6:30-7:30 a.m.
Race Start Time: 8:00 a.m.
Veterans Day Weekend Celebration: 9:30 a.m. - 2:00 p.m. Location: Start and Finish Line is at Charnow Park, located at 300 Connecticut St, Hollywood, Florida 33019. Immediately following the award ceremony will be a Veterans Day Weekend Celebration with Sponsor Booths, Live Music, Silent Auctions, Raffles, and more. Top 3 overall male and female 5K finishers. Any participants who are Purple Heart Receipients are eligible to register and run free of charge. In order to do so, you must contact us so we can provide you with a code to enter when you check out. Sponsorship opportunities are available. The success of this fundraising event depends on the generosity and support of people like you. Please contact Trista Boyenga at tboyenga@gmail.com for information on sponsorship packages.